Since owners are fleeing their SUVs like rats from a sinking ship, it seems like a great time to put together a list of the top used SUV bargains. Luckily, Popular Mechanics has put together just such a list. After all, some people out there actually need a purposeful wagon to take them off-road or help them haul a trailer and family. As such, there isn't a single crossover on the list, but you can be assured that these rugged trucks will get the job done without forcing you to work a second job. We've even found an example of each for sale on Ebay, to give you an idea of what's really on the market. 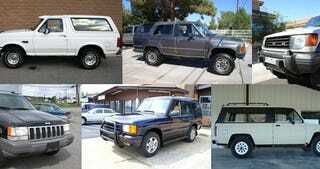 Oh, and we've also included one very Jalopnik-approved used SUV that may or may not be a bargain. Check out the list below.